Whereas it is the duty of the Culpeper County Democratic Committee to issue the Call to Caucus for the purpose of electing delegates to the 2017 30th District (Orange, Madison and Part of Culpeper) House of Delegates District Democratic Convention which will be held on the 29th day of April in 2017, beginning at 10 am, in the Culpeper County Democratic Committee Head Quarters located at 102 North Main Street, Culpeper, VA, 22701, on the second floor. Now therefore be it resolved that the Culpeper County Democratic Committee hereby issues the Call to Convention for the 2017 Democratic Party Caucus to convene at noon, at the Culpeper Co. Democratic Committee 102 North Main Street, Culpeper, VA, 22701 for the sole purpose of electing delegates to the 30th House of Delegates District Democratic Convention. I’m really getting tired of people deflecting, distracting, and using false equivalence about subjects they’re incapable of understanding. It’s especially infuriating when those people hold elected office in the United States Senate. Hello? Read a briefing. It’ll be one of those stacks of papers with words on it. Probably in a binder of some sort. Susan Rice served as President Obama’s national security adviser. Republicans really hated her and used her as a negative talking point despite the fact she’s never been under an FBI investigation for treason and sought immunity. Republicans are accusing her of making requests for the identification of Americans caught inadvertently in surveillance of foreigners, specifically those who work for Donald Trump. Rice has neither confirmed nor denied making such requests, but the thing is, it’s not illegal. In fact, it’s part of her job. First off, after the national security adviser makes a request it has to be approved by the National Security Agency. Rice said she had sometimes asked for the names of Americans whose identities were redacted in her daily intelligence briefings in order to understand the context of what she was being told. The purpose, she said, was “to do our jobs,” but “absolutely not for any political purpose, to spy, expose, anything.” She didn’t say if she had sought names of anyone from the Trump campaign. You know, we wouldn’t have this issue if so many of Trump’s people weren’t having so many conversations with Russian spies. 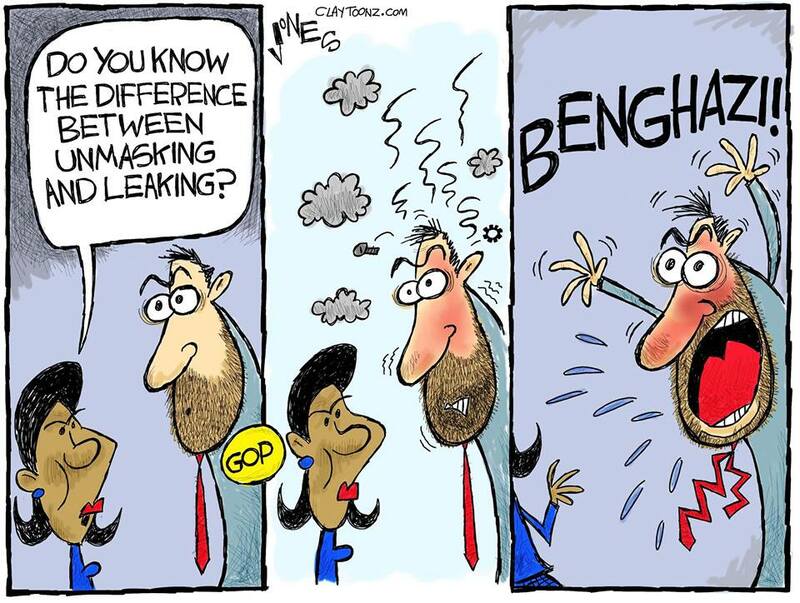 Requesting for an identification is referred as “unmasking.” When someone gives a name to the press, that’s called “leaking.” Unmasking is not leaking. Republicans are going to town accusing Rice of leaking Michael Flynn to the press. Who else knew Flynn had talked to the Russians and had lied about it? Oh, only the Justice Department, the FBI, the Trump administration, and god knows who else. The Trump administration kept him on the job for over two weeks AFTER discovering he had lied about talking to the Russians. There’s not any evidence or smoke that Rice leaked his name (all that smoke you’re seeing is from Trump Tower). Despite this, every single unethical race-baiting conservative website went crazy with the accusations. Trump himself retweeted a link from the Drudge Report with the headline “RICE ORDERED SPY DOCS ON TRUMP?”. Like the all caps and question mark they used? Nice! The rule for conservatives is: If one conservative says it happened, then it definitely happened. Who needs evidence or anything to back up the accusation? Tom Cotton, a United States senator, said “Susan Rice is the Typhoid Mary of the Obama administration foreign policy. Every time something went wrong, she seemed to turn up in the middle of it.” He was making another Republican reference to Benghazi. Rand Paul, another senator, said the reports were a “smoking gun.” Rand Paul sure is sucking up to Trump despite the prez once saying Paul debated “without a properly functioning brain” and insulted his looks. Now they’re playing golf together. Maybe Trump had a point about Paul’s brain as, again, unmasking is NOT leaking. Right wing media does not provide smoking guns. And it is too bad about Paul’s face. Senator Lindsey Graham (who once had his phone number leaked publicly by Trump) said he wanted Rice to testify. Testify based upon a theory? I’m really looking forward to the House and Senate investigations wasting time on Trump’s conspiracy theories. You know, when someone throws you a stick to chase you need to make sure there’s actually a stick. Another big bonus for these guys is that Rice is a black female. It’s a good day for them when they can combine their covert sexism with their covert racism. Way to go! Score! To sum up: Unmasking is not leaking. If your entire campaign wasn’t talking to Russians on a daily basis, we wouldn’t be having this issue. Comprehension and not committing treason sure are difficult areas for Republicans. Not just falsehood by falsehood, but as the defining feature of his presidency. 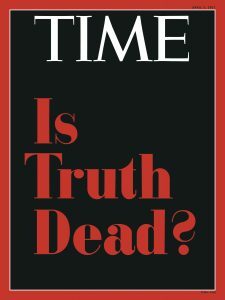 The question on the magazine’s cover refers to Trump’s apparent ability to lie, dissemble, and distract from the truth—and to not only get away with it but to ride those lies to the world’s most powerful office. The story within by Time’s Washington bureau chief, Michael Scherer, rightly takes Trump’s dishonesty as its premise, then asks: How exactly does it work, and why, and can it possibly keep working now that he’s president? It’s a good story, thoughtful and—though Trump would never admit it—fair in the sense that it examines its subject’s penchant for prevarication without exaggerating, distorting, or moralizing.